Three University of California (UC) unions, representing over 50,000 workers, went on strike on May 7-9, in the biggest strike at UC in history. Pickets of hundreds of workers protested at UC campuses and medical centers across the state, with turnout surpassing all expectations. UC management put on a brave face in media interviews, but the impact was significant. Medical centers were forced to cancel 12,000 appointments and, at one campus, 300 surgeries. Some clinics closed entirely and, at UC Berkeley, managers struggled to deal with the crush in dining halls. The picket lines were diverse in the San Francisco Bay Area. While some workers have been on strike in the past, there were many, especially younger workers, who were on their first ever picket line. 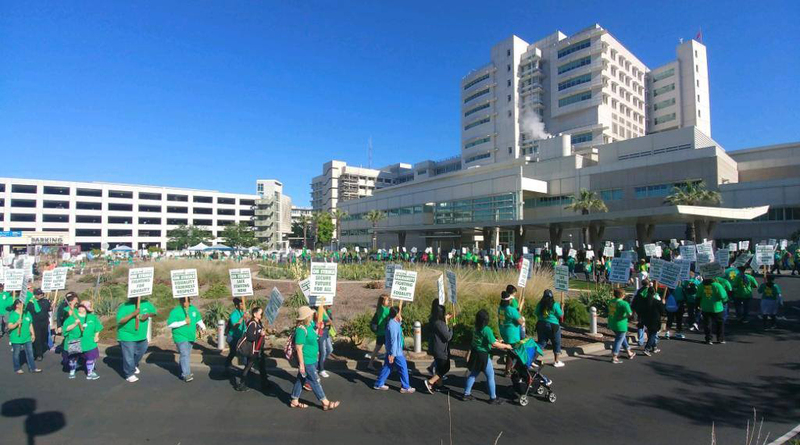 The mood was upbeat as the picket line circled the three-year-old, state-of-the-art Mission Bay hospital, part of a large new multi-billion dollar UCSF campus in San Francisco. In multiple conversations, workers agreed that UC clearly has the money to negotiate decent contracts with the unions. Administrators and managers now outnumber professors in the UC system. The UC medical centers, which are self-supporting and don’t receive funds from the state, are offered as justification by management for the unprecedented increase in administrators at the UC. Compare UC to the California State University system where there are close to three times more professors than administrators. The average compensation for UC executives has increased 58% over the past 10 years. The state of California decreased its funding to UC by 30% between 1999 and 2015, yet UC revenue is up 80% over the last decade. The UC system is rolling in money and is being run like a for-profit corporation, with all the economic inequality that that entails. It prioritizes plush administrative jobs over its employees’ right to a decent and stable living. UC has been offering workers essentially the same dismal contract through months of bargaining. Management wants a dismantling of the employee pension system, full control over health care costs, and minimal wage increases. One-in-ten workers at the UC is now a contract worker, many of whom lack basic job protections and benefits. Why is management refusing to negotiate a decent contract when the state of California is projected to have a $9 billion budget surplus in the upcoming year? Part of UC management’s thinking is the looming Supreme Court decision on Janus, a case that is funded by a who’s who of right-wing corporate interests including the Koch Brothers, designed to weaken public sector unions. If the Supreme Court finds in favor of Janus, it means public sector unions will no longer be able to count on dues coming in from all represented workers, and will need to fight for each and every union sign-up. UC management, led by system-wide President Janet Napolitano – former Secretary of Homeland Security under Obama – appears to be stalling in negotiations with the unions to wait for a Supreme Court ruling on Janus. Leading Democratic Party figures like Kamala Harris and Nancy Pelosi have issued statements registering their opposition to Janus and their support for working people. If the Democratic Party establishment was serious about its support for public sector workers, then the Democratic Party’s Napolitano would put an acceptable offer on the table. Instead, UC management views Janus as a solution to their labor headaches. The University Professional and Technical Employees union (UPTE) was back at the bargaining table the week after the strike with no real progress. To add insult to injury, management is now asking for a weakened grievance procedure for sexual harassment of employees that would suspend union representation for the employee filing the grievance until the management-controlled Title IX process was completed. It appears management’s initial approach after the strike is to dig in its heels. A battle of significant proportions with national implications has emerged at the University of California. Management is looking forward to the destabilizing effect of Janus on public sector unions and their day to day operations. However, union workers showed up to the picket lines in big numbers, including many who are new to union activity. UAW Local 2865, representing UC graduate student instructors, will be out of contract at the end of June, adding the potential to shut down the classrooms. Workers’ strength is in our numbers and in our solidarity. It’s critical to maintain and grow the union coalition that was established with this strike, at both the leadership level, and in the workplace. Union actions up to and including strikes will be much more effective if service employees, nurses, other patient care workers, instructors, researchers, and others are united in the medical centers, labs, and classrooms. Launching an organizing drive against the contractors providing low wage workers for the university can turn a union weakness into a strength. The University of California system is an enormously important public resource providing education, health care, research and jobs that are all critical to California socially and economically. Increasingly, UC has built its prestige with corporate partnerships and massive donations from billionaires for gleaming new facilities, while cost-cutting on labor and hiking student fees. In recent years, UC has significantly increased its admissions to wealthy international students who pay $45,000 per year in tuition. Meanwhile, the university is not admitting all the California high school graduates who meet UC standards, laid out by the state master plan for education, and many potential students are priced out of a UC education. The fight against the privatization of the university should be widened to unite UC workers with students, potential students, and their communities. We need to show management that the teachers’ strike phenomenon can catch fire in California, with campaigns and actions that draw new layers of workers and students into the heat of struggle. Another strike may be necessary to win a decent contract. An escalating series of smaller actions can strengthen our forces, boost new members’ confidence, and increase the pressure on management. A broad campaign to fight the corporatization of UC aimed at workers, students, faculty, and community members can transform the struggle into an open debate on the need for a truly public university in society. We need a UC that pays workers good wages and benefits, cuts student fees, and we need to tax big business and the billionaire class to pay for it. With teachers in West Virginia, Kentucky, Oklahoma, Arizona, and now North Carolina staging statewide walkouts, public sector workers are proving that even an unfavorable Janus ruling and so-called right-to-work legislation are in no way insurmountable barriers to building workers power. Union workers have momentum at UC; it’s time to build an even bigger movement to win.